Obsidian Entertainment today has revealed a new expansive map and combat zone for the vehicle combat game, Armored Warfare. The “Port” map offers many distinct paths through realistic environments, allowing for a variety of strategies to come out victorious at the end of the battle. For Armored Warfare, Obsidian has created environments where it makes sense for armored vehicles to clash and a key trading center like a port is no exception. 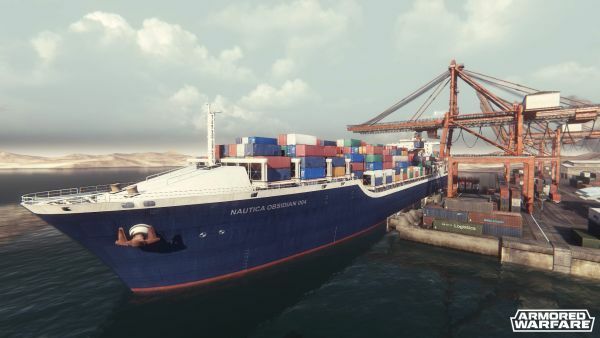 The map for “Port” encompasses a major shipping dock sandwiched between the ocean and the burning heat of the desert where vehicles can stalk each other in between enormous cranes, shipping containers, office buildings and loading facilities. The map includes a variety of dynamic elements including moving cranes and a train which can provide a significant leg up in battle depending on which sides can destroy it first. The industrial maze offers distinct areas that allow each role to play to its strengths. High ground is available for the best view of the map for Artillery, Recon can speed along more open roads, and Main Battle Tanks can blast their way through cramped wreckage. KOG Games announces the start of Grand Chase Season 5, a series of major updates that includes character separation. Nexon America today announced that it will kick-off the closed beta period for Extraction.